Rarely does an artist pay homage to the classics like Dimitri From Paris. The Grammy nominated producer, remixer, composer and DJ has made every one of his repertoire of reworks sound effortless; no mean feat when the original tracks are by the likes of Disco’s greatest musicians. In 2018 he released his “lifetime achievement” on Glitterbox, with the strictly limited pressing of the ‘Dimitri From Paris presents Le Chic Remix’ boxset. Now the 12’s have their own separate outings, bringing greater focus onto the individual productions, as each vinyl features two of the incredible Dimitri remixes, along with their respective instrumentals on the B-Side. 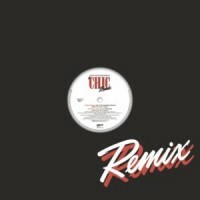 On this record, Dimitri continues to get to the heart of why CHIC’s music remains so universally relevant, underlining the enduring cultural significance of dance music in its most unabashed form with his careful remixing of CHIC classics ‘My Forbidden Lover’ and ‘I Feel You Love Comin’ On’.